Absolutely! Between uses, toys are sprayed with a mixture of essential oils and water. Lavender, tea tree oil, peppermint, and rosemary are all extremely effective and safe as sanitizers. Cloth toys and costumes are washed in our washing machine. Toys may also be washed at a very high temperature in our dishwasher. Please feel free to sanitize the toys using one of these methods before returning them. Can I donate used toys? Any time! 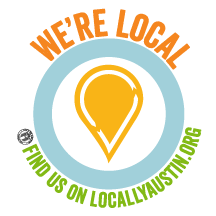 Toybrary Austin gratefully accepts donations of like-new and gently used high quality toys. Due to our high standards, we are selective about which ones we keep. Please do not bring stuffed animals, princess items, or toy weapons. Toys that we do not keep will be donated to SafePlace or CASA. Can my children stay and play? Yes! Your children are welcome to “stay and play” in the play area when you come to check out toys. There are also children’s books to read, comfy places to sit, and self-serve COFFEE! How do I renew the toys I have checked out? You may call or email to renew your toys, with the exception of a few that are only one month rentals. How many toys may I check out? You may check 3 toys out at a time. These may be brought in for exchange as often as you like. The maximum checkout for any set of toys is one month. a) You may buy the identical toy to bring in and replace it. b) Bring in anther safe, educational toy as a replacement. You might already have something appropriate at home that your child no longer uses. These toys will be accepted at the sole discretion of the owner. c) A replacement fee will be charged to your account. The fee is at the discretion of the owner. What happens if we lose a piece to a toy? If you lose a piece, you will have a few extra days to try to find it. If you are not able to find the piece, you will be charged a replacement fee generally between $1.00-$5.00. These fees are at the owner’s discretion. If a missing piece causes the toy to be incomplete, you are welcome to buy the toy (and we hope you find the piece at home), or pay to replace it. Replacement fees are at the owner’s discretion. On occasion, you may be allowed to bring a toy from home (educational and in excellent condition) to replace an incomplete toy. YOUR CHILD’S HEALTH AND SAFETY ARE IMPORTANT! Every toy is carefully prepared for borrowing. Each toy is examined, cleaned, and disinfected between borrowers. These precautions reduce your child’s exposure to germs and safety issues resulting from damage and wear.